Commercial and industrial water treatment services offer the best and most complete water solutions. We carry a full line of water equipment and we have the right solution to meet your water treatment needs. From manufacturing, medical, and commercial; we provide comprehensive water treatment solutions. If you have industry questions or want to learn about us, we always have up-to-date information. Our emergency service team is ready to help at a moment's notice. Complete Water Solutions Services Clients Anywhere! No matter your location, Complete Water Solutions can help with all of your Reverse Osmosis parts, service, and repair! Honesty & Integrity – We will always be honest with ourselves, our customers and our team members. Determination – we will have unflinching determination in providing the best service possible to both our customers and team members. Pursue Growth & Learning – we will embrace personal growth, team growth and encourage the sharing with others. We will continue to learn and become better to better support each other and our customers. Community – We care about our community and will help support positive outreach programs. Contact us to save time and money. We are experts, not just parts changers. Complete Water Solutions provides comprehensive commercial and industrial water treatment equipment in the Midwest. Complete Water Solutions is experienced in providing the right solution for any water problem. We are committed to customer service; consistently completing the job efficiently and correctly, setting Complete Water Solutions apart from the competition. We care about the quality of your water, whether it’s for your boiler feed or for your production, great quality water can help reduce production loss, energy consumption, and down time. Our team of water treatment system installation and repair experts are with you every step of the way. Whether you run a multi-million dollar manufacturing facility or simply need quality water treatment in a single building, we treat every job the same, providing you unparalleled service. Water treatment system installation and repair is a necessity. Complete Water Solutions services commercial and industrial water systems from Wisconsin to Minnesota, Illinois, Indiana, and beyond. You can’t afford to go very long with a malfunctioning water treatment equipment. Companies need someone they can depend on to quickly and affordably fix their water treatment system problems. Complete Water Solutions is the go-to resource for all commercial / industrial repair and installation services. We know how important it is for your business to have clean, running water. Many problems can bring production to a halt and cost you money. Our goal is to provide thorough repairs as efficiently as possible to get your water system and company running again. 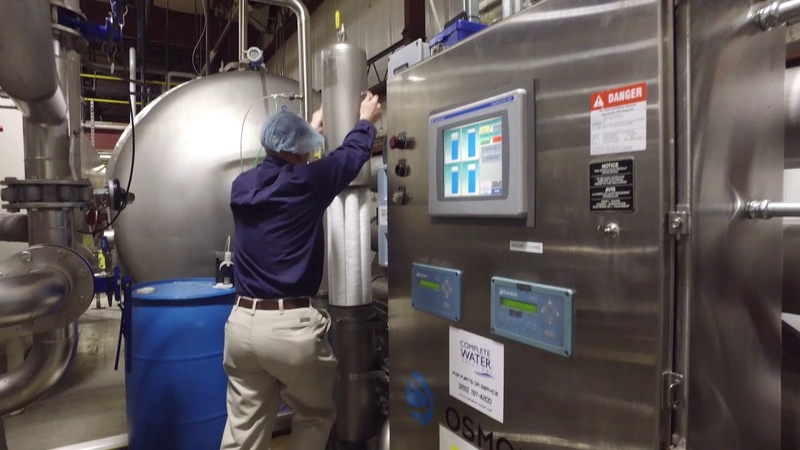 Complete Water Solutions can perform a free system analysis for your industrial water system to get started on protecting your water treatment equipment. Setting up a preventative maintenance agreement can then keep your water system regularly checked for reliable service. Complete Water Solutions is partnered with many water treatment manufactures, ensuring you get the best equipment in your industry. If you are in need of water treatment installation or repair, we are ready to serve you. We only use the best equipment, from replacement parts to our own tools, to guarantee reliable results for your water system. When you have your water treatment system installed or repaired, we will provide you with complete documentation. Complete Water Solutions wants you to have the most convenient & reliable experience possible. We provide paperless documentation to all our clients, so you understand and can review what you are paying for. All paperwork is completed online, so you have access to information on the work done, work files, pictures and even the technician who worked on your system should you have any questions. Complete Water Solutions is certified as a Women's Business Enterprise by the Women's Business Enterprise National Council (WBENC), the nation's largest third-party certifier of the businesses owned and operated by women in the U.S.